Some women age well. Hailey doesn’t age at all. She knows she must be some type of paranormal yet she’s never met another being like her… until she meets Oro. This arrogant, handsome dragon shifter claims she is his mate, and insists they bond immediately. Oro is a golden dragon shifter. He is handsome and strong and a dragon so he doesn’t understand why Hailey refuses to bond with him. 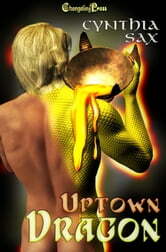 He covers her with molten gold and sets her body ablaze, yet she continues to refuse his advances. What more can a female dragon want… than him?